1. Goals: Create clear, appropriate investment goals. 2. Balance: Develop a suitable asset allocation using broadly diversified funds. 4. Discipline: Maintain perspective and long-term discipline. These are just the basics but knowing and using these concepts will put you ahead of probably 80% of all investors these days. 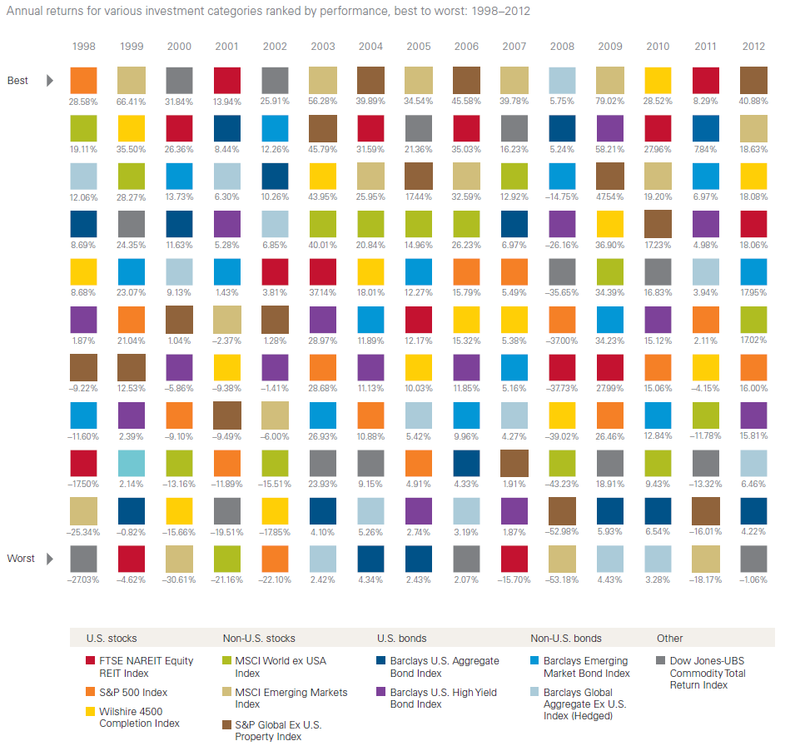 The wide assortment of colors shows how market performance changes from year to year in a seemingly random pattern. This is a great illustration for the benefits of having a globally diversified portfolio (something I’ll cover in more detail in my next post). These are just the short and sweet takeaways but the report is full of good advice and statistics so read the whole thing for more details. Ben, it would be nice if you can make the picture enlargeable so we can open it in large window or so. Now it is compressed and hard to read, at least for me. The listed objectives are a mantra of investing. I learned hard myself the importance of having them in place before committing your hard earned cash. Mainly your goal, strategy and patience. Thanks for the heads up Martin. You should be able to click on the image to zoom in now. Unfortunately, these principles are easier said than done.